Remember that head of purple cabbage from week one of the SNAP Challenge? Well, to my surprise, it still hadn’t gone rotten. Sure, it was a little discolored on the open/cut surface, but I just sliced a thin 1/4 inch off the front, peeled off a couple outer leaves, and it was as good as new! 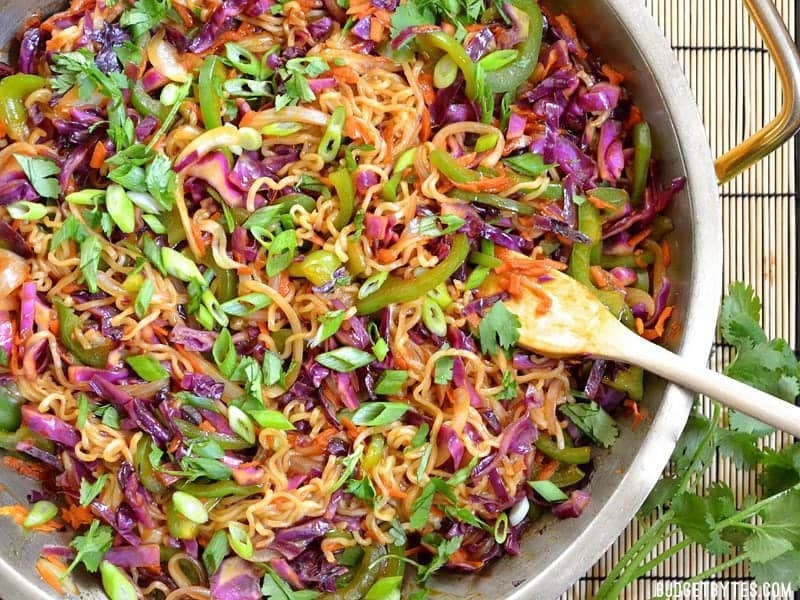 Not wanting to let my precious vegetable to go to waste, I made that purple cabbage into a colorful, delicious, and super easy Vegetable Stir Fry with Noodles. I bought a couple extra vegetables to add to the stir fry (carrots, green bell peppers, green onion, and cilantro) and used an onion that I already had on hand. In interest of making this stir fry as simple as possible, I made the most basic of basic sauces (just like the sauce on the famous Dragon Noodles) with just soy sauce, brown sugar, sriracha, and some corn starch for thickness. Cook everything up in a super hot skillet and you have an amazingly fast veggie-full meal. 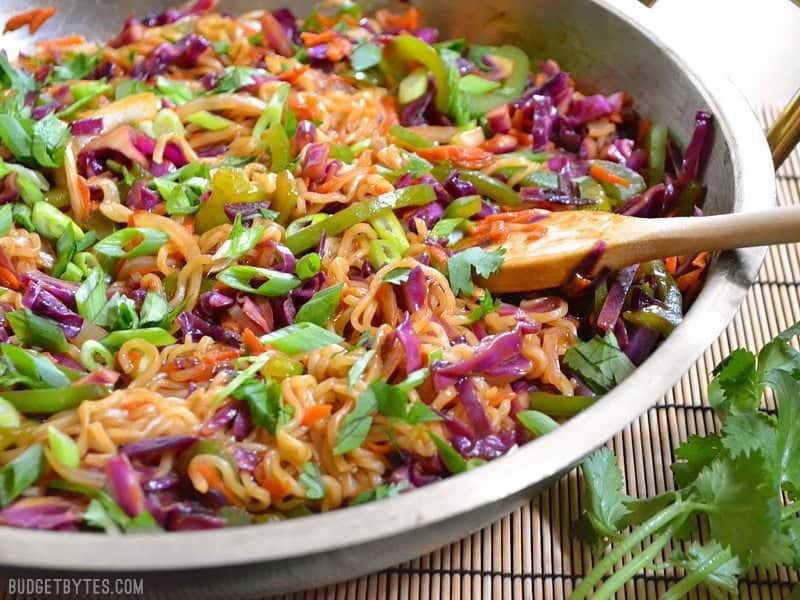 If you’re not into ramen noodles (I know someone is about to leave me a comment about how ramen is the devil), you can spoon the sauced up stir fry vegetables over a bowl of warm rice. That would be just as awesome and just as cheap (maybe even more so)! I wasn’t expecting this stir fry to hold well in the refrigerator all week, but I have to admit, I kind of like the refrigerated leftovers. The colors definitely aren’t as vibrant after a day or so and everything turns kind of violet from the purple cabbage, but the sauce gets all thick, the vegetables soften a bit more, and it almost tastes kind of rich. If you’re really put off by soft noodles, you may not like the leftovers as much, but I’ve totally been digging them! For the entire month of September, I’ll be participating in the SNAP Challenge and attempting to eat on $4.50 per day. Read more here. 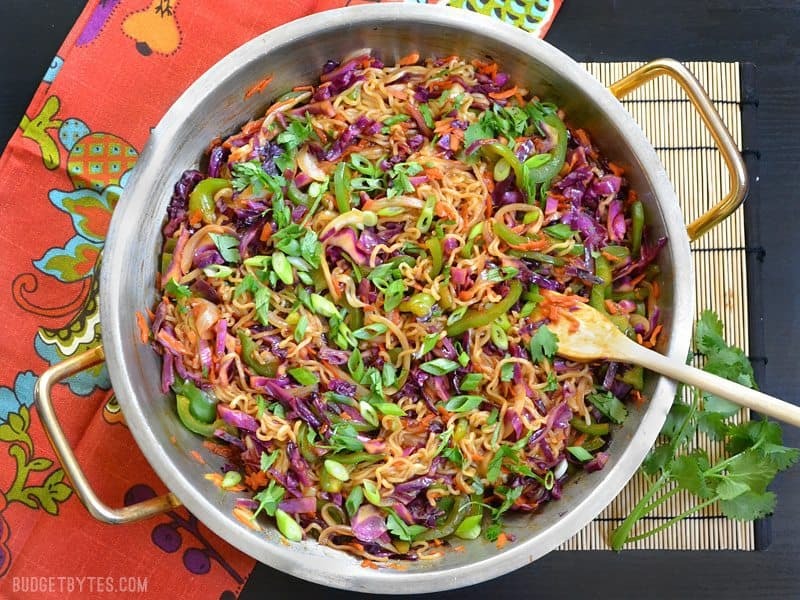 This colorful vegetable stir fry with noodles is packed with vegetables and drenched in a salty sweet sauce. Fast, easy, and customizable. Remove the core and any wilted outer leaves from the cabbage, then cut it into very fine strips. 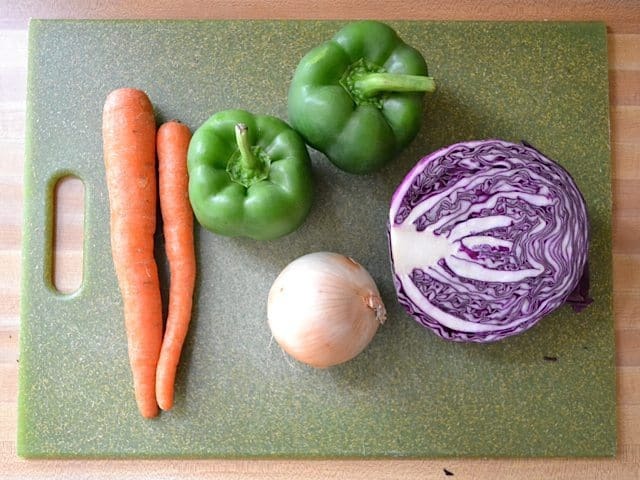 Cut the onion and green bell pepper into thin strips as well. Use a large holed cheese grater to shred the carrots. 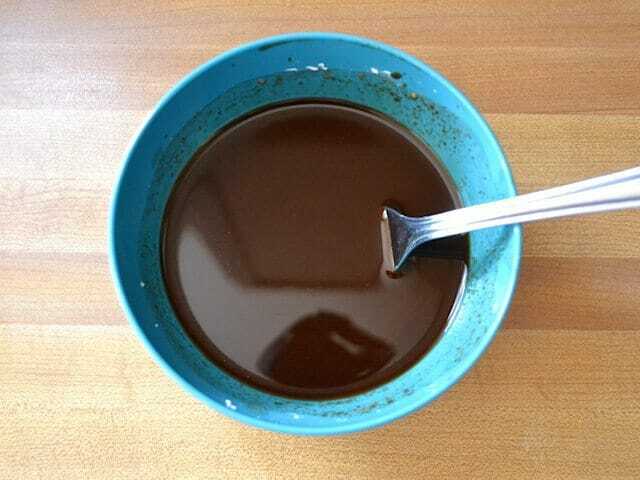 In a small bowl prepare the sauce by stirring together the soy sauce, brown sugar, sriracha, and corn starch. Begin to cook the noodles according to the package directions (boil for 3 minutes, or until tender). Drain the cooked noodles in a colander. Heat the vegetable oil over medium high heat in a large skillet until it is hot and shimmering. Add the vegetables and sauté for only a few minutes, or until the vegetables just begin to soften. 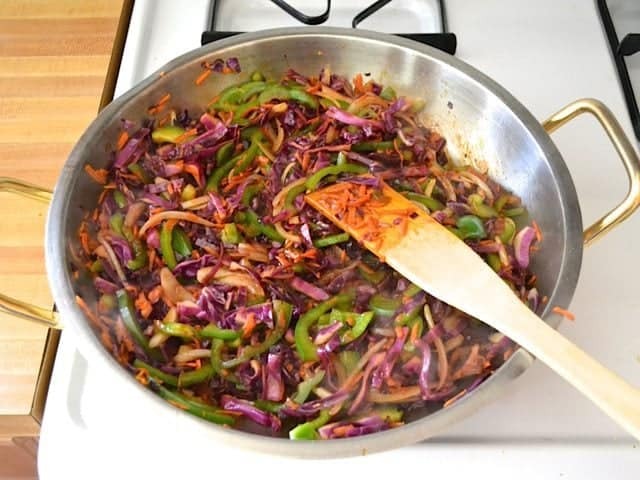 Pour the prepared sauce into the skillet and continue to sauté for one to two minutes more, or until the sauce has thickened and coated all of the vegetables. Turn off the heat. 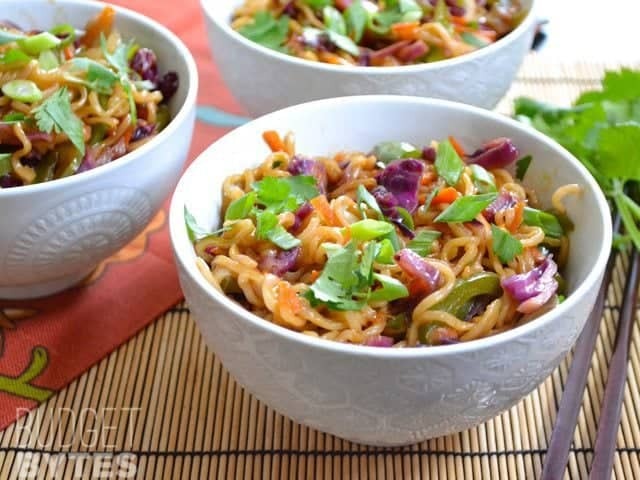 Add the cooked and drained noodles to the stir fried vegetables and toss to combine. Top with sliced green onions and a handful of fresh cilantro, if desired. Begin by preparing your vegetables. The cooking process is fast, so you need to have it all prepped ahead of time and ready to go. 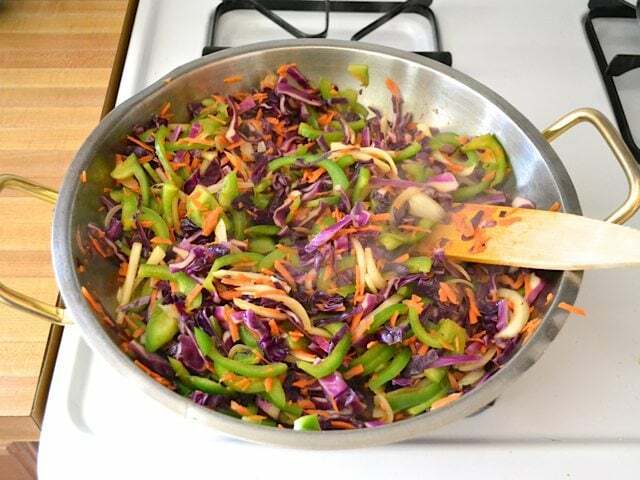 I used 1/2 head of purple cabbage, 2 green bell peppers, 2 carrots, and one yellow onion. 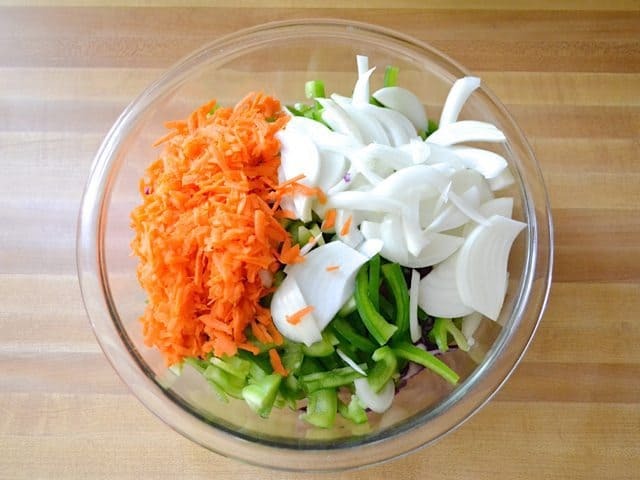 Cut the cabbage, onion, and bell pepper all into thin strips and use a large holed cheese grater to shred the carrot. Prepare the sauce ahead of time, too, so it’s ready to pour in when you need it. In a small bowl stir together 1/4 cup soy sauce, 3 Tbsp brown sugar, 1 Tbsp cornstarch, and about 2 Tbsp sriracha (less if you’re not that into hot stuff, but you want at least some because it provides the acidic vinegar element to balance the sauce). Cook two 3-oz. 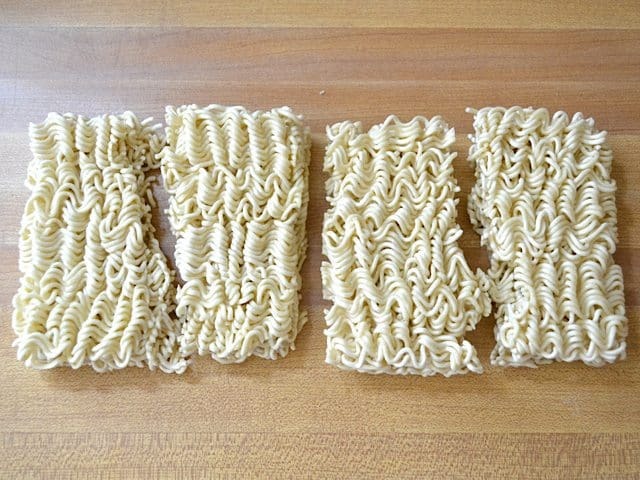 bricks of ramen noodles according to the package directions (boil for three minutes), then drain in a colander. I broke the bricks in half so that the noodle strings wouldn’t be quite so long. 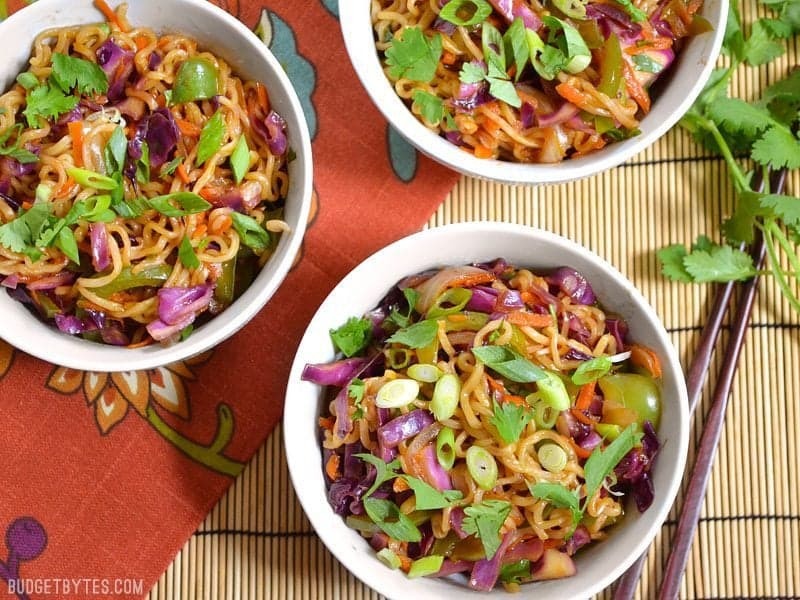 Long noodles are really hard to stir in and combine with chunky ingredients, like the vegetables. Shorter strands combine easier. Heat two tablespoons of vegetable oil in a large skillet over medium-high heat. When the oil and skillet are very hot (the oil should look shimmery or wavy on the surface, but not smoking), add the vegetables and sauté for a few minutes, or JUST until they begin to soften. They’ll continue to cook a little more in the next couple of steps, so you don’t want to over cook at this point. Pour the sauce over the vegetables and sauté for one to two minutes more, or just until the sauce has thickened and coated all of the vegetables. Finally, stir in the cooked ramen until it is well combined with the vegetables and coated in the sauce. Top the stir fry with sliced green onions and a handful of cilantro (if desired). Enjoy! This recipe is amazing! I’ve made it twice now exactly as written (topped with pan-fried tofu) and my husband and I love it. 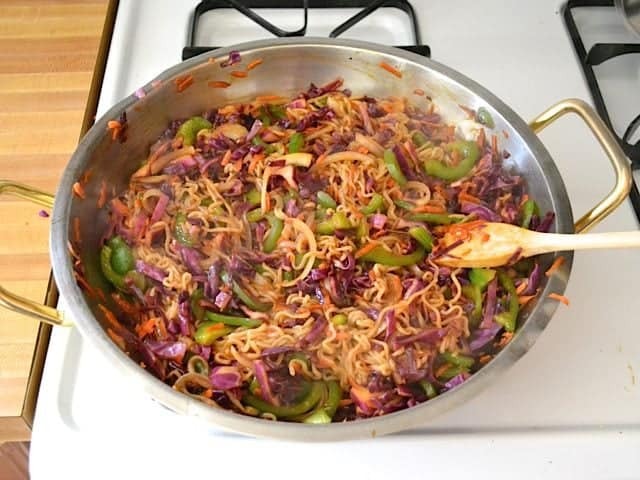 We’ve since modified the recipe slightly by doubling the cabbage and omitting one package of noodles (we are cabbage freaks) and it is still so so so good!